In mammals, gamma-aminobutyric acid, GABA in abbreviated form, is the central nervous system’s main neurotransmitter inhibitor. It is a neuromodulator that is known to act as an inhibitor in adults and plays an important role in preventing prolonged neuron excitement. It also plays a neurotrophic role, that is to say it promotes the growth of certain neurons. GABA’s inhibitory effects counterbalance the excitatory effects of glutamate. An imbalance between these two neuromediators is linked to epilepsy or cerebral ischemia. GABA is involved in at least 30% of brain synapses. GABA reduces anxiety, improves mood, and facilitates deep sleep. GABA can be an interesting alternative for people who wish to control mild anxiety without using medication (benzodiazepines). Sleep disturbances such as difficulty falling asleep or staying asleep, early morning waking, or agitated and unsatisfying sleep. L-Theanine is an amino acid that is naturally present in green tea. It has calming and relaxing properties and contributes to the regulation of dopamine, GABA, and serotonin levels. A plant widely recognized for its sleep-inducing properties, valerian calms the nervous system in general. It is also effective for headaches, digestive problems, and other problems caused by nervous tension or stress. It reduces spasms and convulsions. Valerian has the advantage of not prolonging its effect the next day like certain sleep medications. Traditionally used for its relaxing, calming, and stress-relieving properties, it has well-recognized effects on nervousness and sleep disturbances. Passion flower is well-tolerated. It promotes muscle relaxation and makes it possible to achieve restorative sleep. Reduces sleep disturbances, anxiety, and nervous agitation. Both the Commission E and the ECSOP have approved the use of hops strobiles to combat agitation, anxiety, and sleep disturbances. Reduces agitation and insomnia related to nervousness. The World Health Organization recognizes the use of camomile to calm nervous agitation as well as the minor insomnia that often accompanies it. Melatonin is a hormone produced by the pineal gland (also called epiphysis). The secretion of melatonin is inhibited in the presence of light and is stimulated in darkness. Its maximum production occurs between 2:00 a.m. and 5:00 a.m. This explains why it is often called the hormone of sleep or the hormone of darkness. The pineal gland uses melatonin to inform the brain of the relative duration of hours of darkness and daylight over a 24-hour period (daily cycle), but also throughout the year (seasonal cycle). By secreting melatonin, the pineal gland “tells” the brain that it is dark and therefore time to sleep. Melatonin synchronizes our biological clock and dictates changes in our metabolic activity. Furthermore, melatonin exercises an anti-stress effect, facilitates nocturnal recovery, stimulates the immune system, and with its antioxidant action, protects the body against free radicals. Disruption in the production of melatonin can cause sleep disturbances, sluggishness, and mood disorders. As we age, melatonin production sharply decreases. The total quantity of melatonin decreases significantly, and the day/night cycle becomes less contrasted. These deficiencies cause insomnia. The body must recharge its melatonin levels to experience restorative sleep. Furthermore, a magnesium deficiency, which can be a direct consequence of a high stress level, is unfortunately linked to a decreased resistance to stress. It can also lead to a generalized state of nervousness, anxiety, and depression! The elemental magnesium content of salts varies considerably and is not always specified. However, the magnesium these salts contain is not always assimilable by the body. Thus, magnesium oxide contains 60% elemental magnesium, but has mediocre bioavailability. If a magnesium salt is difficult to assimilate, the body will use it less, and its laxative effect will be amplified. Unless this effect is desired, the use of magnesium sulfate should be avoided since it has the most violent laxative effect. In a study performed on volunteers involving 11 different magnesium salts, the most laxative ones were sulfate (96%), lactate (32%), and phosphate (20%). The salt that was best tolerated was magnesium glycerophosphate; it produced the same result as the placebo. To correct or prevent a magnesium deficiency, it is best to choose a form that offers a good bioavailability and solubility and that can be taken over long periods of time (3 months). There are two forms of magnesium that fit the bill: magnesium glycerophosphate and magnesium bisglycinate with a special mention for bisglycinate, a form in which magnesium is linked to an amino acid. 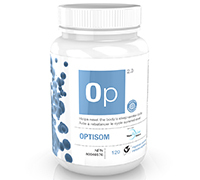 This chelated form improves sensitivity to the magnesium’s bioavailability. Vitamin B6 (pyridoxine) aids the metabolism of amino acids and carbohydrates. It also helps maintain a healthy nervous system, participates in the synthesis of red blood cells, and can alleviate anxiety and depression symptoms. Vitamin B6 promotes a healthy cardiovascular system by reducing homocysteine levels in the blood and can help reduce premenstrual symptoms (PMS). Furthermore, it helps reduce pain and inflammation associated with carpal tunnel syndrome. Recommended Use: Helps to temporarily promote relaxation. Helps increase the total sleep time (aspect of sleep quality) in people suffering from sleep restriction or altered sleep schedule. Helps to reduce the time it takes to fall asleep (sleep onset latency aspect of sleep quality) in people with delayed sleep phase disorder. Helps re-set the body’s sleep-wake cycle (aspect of the circadian rhythm).